(The Inn is close to the LIRR and to highways. Steffie was a long-time political activist, ardent feminist, and a talented spokesperson for peace, racial equality, and social justice. 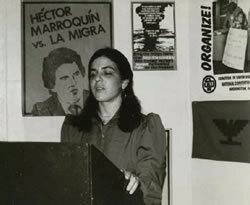 A founding member of the Socialist Workers Party in Pittsburgh, and SWP candidate for public office, she later became a member of Solidarity, and of the Green Party. She worked for WNET public television in the early 90’s, and was a volunteer activist and occasional broadcaster at Pacifica radio station WBAI. Steffie was a vibrant, passionate, dedicated person, with a quick wit and lively sense of humor. She will be greatly missed by many friends, comrades, and loved ones. Please send photographs, other memorabilia, and requests for more information to Linda Loew at: loewmiller@msn.com or call 773-255-7932.